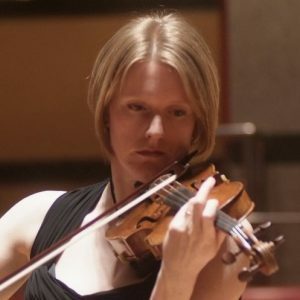 Following a music degree from the University of East Anglia, Rachel Gough studied with Frances Mason at the Royal College of Music for an MMus Degree in Advanced Performance. Rachel is regularly in demand, both as a soloist, and as an orchestral and chamber musician in the South West. She has a highly successful violin and organ duo with her husband Rupert. The Gough Duo has made many recordings and tour regularly across the United States and in Europe. Their latest disc of the complete works for violin and organ of Rheinberger is due to be released on the Molltertz label in April 2010, and they have a new recording of works composed for them by the American composer Carson Cooman recently released on the Naxos label. In 2009, the Duo performed to a capacity audience at the Svetlanov Hall for the Moscow International Organ Festival, and at venues including Birmingham Symphony Hall and Westminster Cathedral.